For Mauro Baldi it must have been quite a shock to find himself languishing at the back of the grid during 1984. The previous years he had been F3's starlet, Mauro taking the European crown in 1981 for Euroracing, then promisingly debuting for Arrows and being snapped by his old Euroracing mates for a 1983 Alfa Romeo campaign, partnering Andrea De Cesaris. The dream turned into nightmare when internal conflict rocked the team's faith, Mauro unable to deliver. 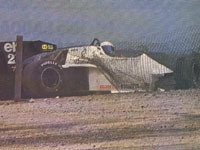 By mid-season - at about the time Paolo Pavanello finally fired designer Gérard Ducarouge - Baldi finally got the 183T going, qualifying in the top ten in various occasions and finishing 5th in Holland. But it all didn't help and the team which had delivered him the European F3 crown ousted him when new sponsor Benetton preferred to go with the more respected line-up of Patrese and Cheever. So where was Baldi to go? A change to John Wickham's Spirit outfit seemed destined for failure, as the previously successful F2 squad had lost its mighty Honda power to Williams and had to make do with Brian Hart's straight-4 turbo. Also, the Coppuck-designed 101 was just as bereft of colour as the team's wallet was of money. Although Mauro tried hard, overcooking it quite some times as here in Dijon practice, he was replaced by rent-a-driver Huub Rothengatter, the Dutchman bringing in just enough cash to get the team through summer. At season's end Mauro was back with the team and continued into 1985 with a D-spec version of the outdated 101 but after three races Spirit had to call it a day. Having two-timed for Martini Lancia Mauro embarked on a very successful follow-up career in sportscars and GTs, soon becoming one of the world's best endurance drivers. Baldi's sportscar palmares is impressive indeed, jointly taking the 1990 WS-PC title for Sauber-Mercedes before joining erstwhile rival Peugeot for the swansong sports-prototype championship in 1992. Although he openly admits to hating 24-hour events, Mauro is at his best at Le Mans and Daytona and has led the JB Ferrari and Doran Ferrari/Dallara-Judd squads over the recent years, taking the 2002 Daytona 24 Hours for Doran.